Serbia is hurrying to build a highway to the Bulgarian border before the completion of the second Bulgarian bridge on the Danube, according to Serbian Transport Minister Milutin Mrkonjic. In 2010-2011, Bulgaria and Serbia have stressed the need to complete the construction of the Sofia-Nis Highway, with Bulgaria taking steps to construct the 70-km section from Sofia to Kalotina on the Serbian border. 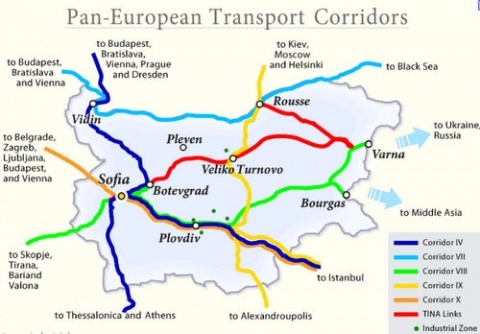 The route is part of the so called Pan-European Transport Corridor No. 10 from Istanbul to Central Europe via Sofia and Belgrade. Meanwhile, Bulgaria is also working on the vastly-delayed construction of a second bridge linking it to Romania, the so called Danube Bridge 2 at Vidin-Calafat, which is expected to finally be completed in mid 2012. The bridge is expected to boost traffic along the route of Pan-European Transport Corridor No. 4, which starts from Greece's Thessaloniki (another arm starts from Turkey's Istanbul), and via Sofia and Vidin in Bulgaria goes off to Central Europe. Speaking on Thursday, Serbia's Transport Minister Mrkonjic has declared that the construction of the highway along Corridor 10 is extremely crucial for both Bulgaria and Serbia, the BNR reported. Serbia hopes to complete the second between Nis and Tsaribrod (Dimitrovgrad) by the end of 2012. The so called "railway highway" between Nis and Sofia is still in the making as well, as the Serbian section between Nis and Tsaribrod is the only part of Corridor 10 that has not been electrified; this is expected to be done with a loan from the Czech government. "Of course, the Danube bridge at Vidin-Calafat is a competitive project, that is why we are rushing with our work," Mrkonjic is quoted as saying.